UPDATE FEB 11, 1:30pm: The event will proceed as scheduled this evening, regardless of the weather. 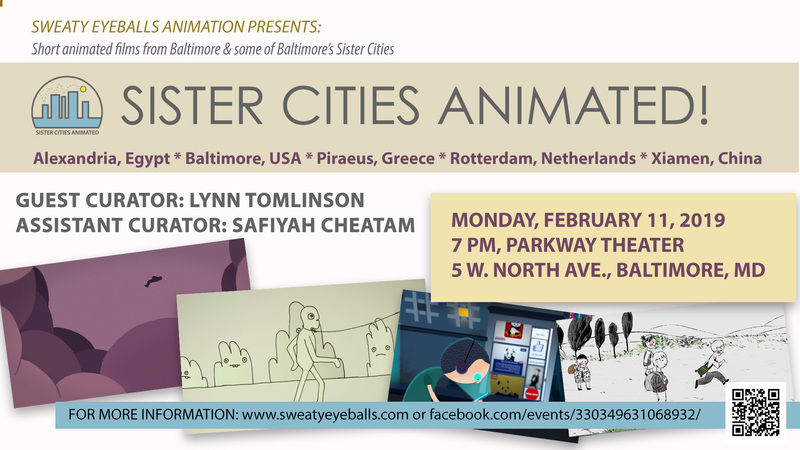 SISTER CITIES ANIMATED is an international screening of short animated films created by artists working and/or residing in Baltimore and in Baltimore’s Sister Cities, curated by award-winning animator and animation scholar Lynn Tomlinson, with help from assistant curator Safiyah Cheatam. This will be a one-night event on February 11, held at Baltimore’s beautifully restored historic Parkway Theatre. Tickets are available for purchase at the event. CURATOR: Lynn Tomlinson is an artist and independent animator and Assistant Professor of Electronic Media and Film at Towson University. Tomlinson is a well established multi-disciplinary artist and filmmaker, specializing in clay-on-glass animation. Her films have been exhibited in over 30 international festivals and has been shown in several prominent galleries and museums. She is a recipient of many festival awards and artist state artist fellowships. More at lynntomlinson.com. SISTER CITIES ANIMATED will be presented as part of the Sweaty Eyeballs series, curated by Phil Davis, Associate Professor of Art at Towson University. Since 2012, Sweaty Eyeballs’ animation screenings have attracted viewers from all over Baltimore, MD including artists, critics, and art consumers from local universities such as Towson University, Maryland Institute College of Art, UMBC, etc. and art institutions such as the Baltimore Museum of Art and the Maryland Film Festival (MdFF). These screenings are now featured as a monthly events at the MdFF’s Parkway Theatre in Baltimore’s high-traffic Station North Arts District.